Sullivan County Jail Unit members gather after attending a county legislature meeting, where they asked legislators to help them reach a fair contract. 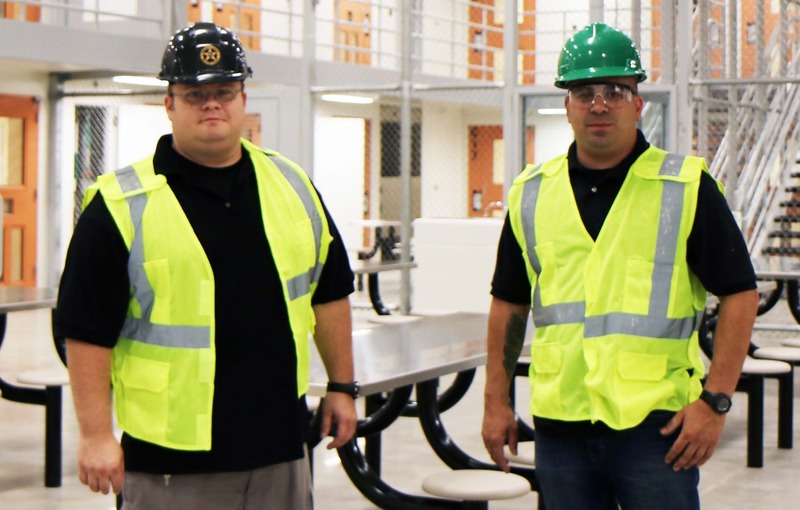 Vice President Corey Dowe and President John Wagner, Sullivan County Jail Unit, participate in a walk-through of the new Sullivan County Jail, which is in the final stages of construction. MONTICELLO — While lawmakers here are more accustomed to sitting before a nearly empty room, it’s been tough finding an open seat at Sullivan County Legislature meetings for the past few months. Instead, legislators have faced a sea of faces clad in black polo shirts, all emblazoned with the CSEA logo. Our members working for the corrections division of the Sullivan County Sheriff’s Office have been ramping up their campaign for a fair contract and turning up en masse to legislature meetings is to show that they are sticking together. Joining them more recently are community supporters. The unit, which represents corrections officers, security guards and other workers at the jail, has been unable to reach an acceptable contract deal since the prior agreement expired at the end of 2012. Fair wages and taking the steps needed to prevent high turnover are key priorities, Wagner said. Newly-trained county corrections officers often leave once they find jobs with higher-paying agencies. Workers have faced added challenges in recent years as they deal with an increase in inmates affected by mental illness or opioid abuse. With negotiations at a standstill, unit leaders worked with CSEA staff to raise awareness about the contract stalemate and generate community support. In addition to attending legislature meetings as a group, unit leaders have spoken with local media and other activists have used social media as a tool to mobilize supporters. That outreach has resulted in community members joining them at legislature meetings. Not only does worker turnover cause stress, workers will soon be moving from the current jail, built in the late 1800s, to a brand new, state-of-the-art facility. That move will require workers to undergo training that will equip them to work in a high-tech jail with computer-runsecurity features, a far cry from the outdated facility that has faced constant maintenance issues due to age. As they move forward with negotiations, our union members are grateful for the growing support.